Last week, I posted a story and a long rant on the Senate's attempts to open the Alaskan National Wildlife Refuge for oil exploration and drilling ... again! Well, it seems that the provision to open up ANWR has made it into the Budget Reconciliation Bill and will be voted on soon by the House and Senate. I urge you to read my previous post, and then go here to send an email to your congressmen or women and urge them to VOTE NO on the Budget Reconciliation Bill. Send it back to comittee until they axe the ANWR provision. The link above contains a template letter that you can add to or edit and makes it easy to find your representatives and tell them what you think. It will only take a couple of minutes so please make the effort. The nation's first offshore wind development may be coming to Texas. The Lone Star State has signed an agreement with Galvestone-Offshore Wind, a division of Louisiana-based Wind Energy Systems Technologies (WEST), to build a 150-MW development off the coast of Galveston Island. The development will sit on 11,355-acre situated about seven miles off the coast of the island and leased from the state. Jerry Patterson, Commissioner of the Texas General Land Office, who approved the lease declared, "Today marks a new era for energy development in America, and what better place to begin than Texas. Texas knows energy, and we’re ready to lead the nation toward establishing clean, reliable coastal wind power as an energy reality." The aggreement allows WEST to begin construction of two 80-foot meteoroligal towers on the lease site to begin collecting wind speed measurements and other data. The towers will be financed with $3-5 million of WEST's project funds and will collect data to confirm the suitability of the site for windpower development and to determine the optimum placements for the wind turbines. This valuable data will also be used by the Texas General Land Office to prove the Gulf’s wind possibilities, perhaps paving the way for more offshore development in the region. Additionaly, while meteorological measurements are collected, the company will run studies of bird migration patterns for state and federal permits. This will likely to be the largest hurdle for the developer to clear as has often been the case for wind developments. WEST will focus on the 2006 spring migration and use the data to plan how best to reduce the wind energy development’s potential impact on birds. Assuming the research phase confirms the suitability of the site, a construction phase will begin in which WEST will erect 50 turbines expected to generate 150 megawatts (peak). No confirmation on which turbine manufacturer they will contract with but those numbers assume 3.0 MW turbines likely with the hub of each turbine rising 260 feet above the sea, and turbine blades up to 55 yards long. The construction phase may cost as much as $300 million and take 5 years [notice this is significantly longer and more expensive than a similalry sized land-based wind development]. During this initial research and construction phases, which will last an estimated 12-18 months for the former and up to five years for the latter, WEST will begin making lease payments of $10,000/year until power production actually begins. At that time, the lease structure changes and WEST begins paying the state an escalating royalty, starting at 2.5% for the first eight years, rising to 4.5% for the next eight years, and capping at 5.5% for the final 14 years. The state should earn a minimum of $26.5 million in royalties over the 30-year lease. These funds will all go into the state's Permanent School Fund (as do royalties from natural gas and oil leases). "an equivalent amount of electricity would require about 20.7 million barrels of oil, or 6.5 million tons of coal, over the 30-year lease. If burned to generate electricity, that much fossil fuel would release 270,000 tons of carbon dioxide each year. About 150 square miles of forest would have to be planted to absorb that much carbon dioxide. Similarly, a 150 MW wind energy development could prevent 21,000 tons of sulfur dioxide and almost 10,000 tons of nitrogen oxides from being emitted over the life of the lease. The wind farm will also conserve more than 6 billion gallons of water over the lifetime of the lease that would have been used in the cooling system of a typical power plant." Texas is currently second only to California in total wind power production. However, the state legislature has mandated that 10,000 MW of renewable energy capacity must be developed by 2025. Current wind power generating capacity in the state is about 2,000 megawatts, with most of the wind turbines located in the western part of the state. Offshore wind power in the Gulf of Mexico may be a viable resource to tap in order to meet these targets. Two other large offshore wind turbine farms have been proposed in the United States, one about four miles off the south shore of Long Island, New York, and the Cape Wind project in Nantucket Sound, off Cape Cod, Massachusetts. Both are in federal, not state waters. The New York project is still awaiting approval by the Army Corps of Engineers and the Cape Wind project faces opposition from resident notables (mostly rich New England Democrats) because of fears it would ruin the ocean view from shore. Still, the Texas project is not expected to produce a Watt of power for at least 5-6 years so either of these other projects, which have been in the works much longer, may still upstage the Texas project. It is good to see more of these projects being proposed as each one increases the likelyhood that an offshore wind farm will be built in the United States. I don't think it will take long after the first one is built for people to begin to recognize their potential and to start to softening their attitudes towards offshore wind. Really, which would you rather have off your coast, a Liquified Natural Gas terminal (a.k.a. terrorist bullseye), an oil refinery, or a wind farm? Which really has the larger environmental impact? Or would you rather simply stop using electricity? I thought not, so perhaps we ought to turn to this clearly least-bad alternative. Wal-Mart, the world's largest retailer has declared that it will pursue a path towards increased energy efficiency. Joining other large corporations recently announcing enviro-friendly campaigns (be they simple greenwashing or a real effort) including GE's 'Ecomagination' Campaign, Wal-Mart will announce specific environmental measures to reduce energy use in its thousands of stores and its truck fleet (the largest in the US) as well as to pressure its worldwide supply-chain of over 60,000 suppliers. build stores that are at least 25% more energy efficient within the next four years. (Wal-Mart has already opened an 'energy-efficient' store in McKinney, Texas which has seen a 10% reduction in energy use during its first two months of operation). Don't be fooled into thinking Wal-Mart is doing this for our sake. This is simply a potent example of how increased energy costs have made energy efficiency an even more appealing prospect for many companies. As usual, the all-mighty dollar rules here. This is an example of retailers getting squeezed by higher energy costs and deciding to pursue energy efficiency rather than passing on these costs to consumers. Companies like Wal-Mart, whose business plan is centered around moving large volumes at small profit-margins per transaction, are especially loath to raise prices and pass the buck on to consumers. They also stand to gain the most by increasing the efficiency of their supply fleet and stores. For example, increasing the fuel efficiency of Wal-Mart's transport fleet as outlined above will save the giant company an estimated $494 million dollars a year! With nearly half-a-billion dollars a year in savings within Wal-Mart's reach, it is easy to see how much promise energy efficiency measures hold for businesses. While we shouldn't be fooled by the greenwashing campaign that will accompany these efficiency measures - Wal-Mart still isn't out for anyone's benefit but their stockholders, whose wallets will be fatter after these measures - it is good to see more companies recognizing that the 'low-hanging fruit' of energy efficiency is ripe for the picking. In the end, we will all benefit in the long run by companies waking up to the cost-effectiveness of energy efficiency. So, as much as it pains me to say it, keep it up Wal-Mart. October 24th New York Times article: "Wal-Mart to Seek Savings in Energy"
Wal-Mart's environmental policies (i.e. department of greenwashing) webpage. Science News Online published an article this month on the many promising recent and ongoing developments in biofuels. Biofuels, ethanol in particular, have been embroiled in debates surrounding their net energy return on investment (EROI) and their supposed limited potential due to the large amounts of (potentially food-producing) land needed to grow them. Well, I've been putting my two-cents in on various debates in the blogosphere for a few months now and it seems that some of the points I was making are starting to hit the mainstream. New developments in cellulosic biorefining, biodiesel from algae, and thermochemical processes completely alter the former terms of this debate giving rise to entirely new (and much better) EROI and yield per acre. That's right, they're at it again. Green Car Congress reports today that the Senate Energy and Natural Resources Committee approved "legislative language instructing the Secretary of the Interior to create and implement an oil and gas leasing program in the Coastal Plain of the Arctic National Wildlife Refuge that impacts no more than 2,000 surface acres. The legislation approved by the committee today is Title IV of the budget reconciliation bill to be marked up by the Senate Budget Committee on October 26." Several ammendments were offered to the language, including one by Senator Ron Wyden (D-OR, i.e. my senator) that would prohibit the exportation of any of the oil or natural gas to come out of ANWR. This ammendment failed 10-12, indicating, as we've already known, that a sizable portion of the oil coming out of ANWR will likely be exported (to Japan, China and other Asian nations likely). "In March of 2004, the Energy Information Administration, at the request of Representative Richard W. Pombo, Chairman of the U.S. House Committee on Resources, published a report using government figures and analyzing—to the extent that anyone can without sinking a well shaft down through the coastal plain—the effect of drilling in ANWR. Given the uncertainty over the exact amount of oil in place, the report lays out three scenarios: one for low-oil resources, one the mean case, the other for high oil resources. The mean-case estimate is that there are 10.4 billion technically recoverable barrels of oil in ANWR, divided into many discrete fields. This estimate includes oil resources in Native lands and State waters out to a 3-mile boundary within the coastal plain area. The mean estimated size of oil resources in the Federal portion of the ANWR coastal plain is 7.7 billion barrels. It will take approximately 10 years to bring the first field on-line (comparable to other Arctic drilling). Assuming sequential development of the fields, rank ordered by size, ANWR production would peak, in the mean case scenario, in 2024 at 870,000 barrels of oil per day. Today the US imports some 10.5 million barrels per day. In 2025, the EIA estimates that almost to double to some 20 million barrels imported per day. Using the EIA’s projections of declines in domestic oil production and increases in oil consumption (mostly from the transportation sector), by 2025 ANWR would reduce US reliance on imported oil by four percentage points—from 70% to 66%. In other words, ANWR oil would make a small difference, but not a substantive, strategic difference. It doesn’t come close to solving the problem or providing “energy security.” Even if peak ANWR oil were available today, the US would still be importing more than 9 million barrels per day, and climbing." Ahhhh! I'm tired of hearing such utter hogwash out of Republicans regarding domestic oil exploration and the effect of the hurricanes. Sen. Domenici says "[If we had been in ANWR already] I don’t think we would be paying $3 a gallon for gasoline today." This is absolute bull$h!t. The reason we are paying $3.00 gallon today is NOT because we are short on crude oil supply after the hurricanes (the Strategic Petroleum Reserve has plenty of crude for us in situations like this). The problem is lack of refining capacity due to several large refineries being shut down in the wake of Katrina and Rita amounting to a sizable portion of our domestic refining capacity (which is already running at a deficit - we already import refined product from Canada and Mexico to make up the gap). Drilling in ANWR would have had no effect at the pump as they are planning on exporting the bulk of the oil produced their anyway (as is evidenced by the defeat of Sen. Wyden's ammendment). And finally, there's no such thing as "environmentally-sound development of oil and gas in the Arctic." Anything we do up there will have its impact on the extremely fragile ecosystem. I'm tired of the excuses and the lies. Let's hear the truth: Exxon and other oil exploration companies want to drill in ANWR for the simple reason that they want to MAKE MONEY! It has nothing to do with domestic security, price at the pump, etc. Republicans have pushed this bill for almost a decade now, facing continued opposition. Yet they continue to push it because they want a slice of the oil money for their next comapaign. If we really wanted to do something about domestic energy security or prices at the pump, we would be talking seriously about energy conservation, investment in renewable energy and clean coal technology (making sure it is manufactured in the United States) and a transition to an electric powered vehicle fleet of some kind - be it hydrogen, EVs or plug-in hybrids - thus ensuring that domestically produced energy can power our transport fleet. This would truly grant us energy independence and security and would lower the price at the pump - or should I say plug. Instead of ANWR, let's invest our money in domestic energy supplies that make sense. If it will take ten years for the first drop of oil to flow from ANWR and if even then it only amounts to less than 4% of our total imports, I see that as a wasteful investment of our money. If instead we invested that money into an infrastructure to recharge plug-in hybrids and the domestically produced electricity to fuel them - in the form of solar, wind and clean coal (i.e. IGCC plants w/ sequestration) - then we could see a MUCH more substantial decrease in our money going overseas to unstable and potentially violent regions like the Middle East. 33%-50% versus 4%. Which one would you rather invest in? Which one is really about energy independence or lowering pricess at the pump? Obviously the $ investments don't equate since Im not sure what either would be exaclty. [Anyone know how much it will cost to get that oil out of ANWR?] The point still stands that investing in efficiency and domestic electricity supply to run EVs or Plug-in HEVs is a real path to energy independence, not ANWR! Don't buy this hogwash! Call your senator and tell them to oppose this attempt to open up ANWR ... again! "Higher natural-gas prices are driving this abrupt change in the economics of Xcel's voluntary wind-power purchase plan. ... Residential customers who buy all of their power from the Windsource program will pay about $59 a month for electricity, on average. That compares with conventional customer bills that will spike from $53 to $69 under Xcel's recent rate-hike filing. The savings will be less for those who signed up for partial wind power." Xcel now expects thousands of its other customers to flock to the Windsource program for purely economic reasons. It may, in fact, run out of wind power. This may force them, according to the Post article, to implement waiting lists for the program as well as consider securing more wind power in their supply mix. It all depends on how long gas prices stay high. Natural-gas prices have soared right along with gasoline prices at the pump in the wake of Hurricanes Katrina and Rita. Natural-gas prices were already rising while wind prices, which are based on fixed levelized costs - wind power's fuel after all, blowing wind, never gets more expensive - have remained level. Katrina and Rita and the havoc they wrecked on domestic supply of natural gas and crude oil seem to be enough to cause a momentus occasion: the wind power price gap finally closed and then reversed itself ... at least in Colorado and at least temporarily. There is, of course, no gaurantee how long natural-gas prices will remain at this elevated level. However, in my opinion, this seems to me a potent reminder of things to come. Declining supply (or at least declining easily accesible supply, both will have the same effect) will cause the price of finite fossil fuels, especially petroleum and natural gas, to increase while the price of clean and sustainable technologies like wind and solar will continue to drop. We no longer live in the age when renewable power was a losing venture and it will only be a matter of time before solar - whether it's concentrated dish-stirling or trough collectors or new thin-film photovoltaics - joins wind as a true competitor for traditional fossil fuels. Resources: Denver Post (10/12/2005): "Energy bargain blowing in wind"
Nanotechnology research is a huge area of contemporary research and has exciting potential in a number of industries from medicine to materials science to energy generation. Today, we'll look at two potential applications of nanotechnology for energy generation. Both offer some pretty incredible numbers and are certainly exciting to think about. Of course, both currently ought to be filed under W for 'wow-this-is-amazing-but-we'll-have-to-wait-and-see' as they are in the early pre-commercialization stages. We first focus on "quantum dots", tiny nano-scale (generally smaller than 10 nanometers) semi-conductor crystals of materials like Cadmium-selenide (CdSe) or Lead-selenide (PbSe). These quantum dots have huge potential for photovoltaic applications because, as semiconductors, they can, like the silicon in traditional PVs, absorb photons from solar radiation and release electrons to generate electricity. However, while silicon-based PVs absorb a small fraction of the energy in the sun - the best acheive efficiencies of only ~33% and most operating around 10-15% - and radiate the remaining portion as waste-heat, quantum dots could theoretically convert up to 65% of incoming solar radiation into electricity. Quantum dots absorb light in a larger spectrum than traditional PVs, have an intermediate bandgap and can produce as many as three electrons for every photon absorbed from the sun - traditional PVs only produce up to one electron per photon absorbed. Furthermore, as they absorb more of the solar energy, they release less in the form of heat, solving some of the heat-managment issues associated with traditional PV designs. Paras N. Prasad, Ph.D., executive director of the University of Buffalo Institute for Lasers, Photonics and Biophotonics and a lead researcher on quantum-dots explains: "Current solar cells act only in the green region, thus capturing only a fraction of the available light energy. By contrast, we have shown that these lead selenide quantum dots can absorb in the infrared, allowing for the development of photovoltaic cells that can efficiently convert many times more light to usable energy than can current solar cells." Prasad and the UB Institute for Lasers have recently patented two new efficient and highly scalable chemical synthesis method for the production of quantum dots. One method is used to produce quantum dot-polymer nanocomposites that absorb photons in the infrared region for use in photovoltaics. The second method produces quantum dots for medical applications where they are used as non-toxic luminence probes that allow bioimaging unprecedented details. Quantum dots could be used to manufacture extremely efficient thin-film PVs. "Because of the efficient photon harvesting ability of quantum dots, in the immediate future we will be able to incorporate a few different types of [quantum dots] simultaneously into a plastic host material so that an efficient and broad band active solar device is possible," said Yudhisthira Sahoo, Ph.D., research assistant professor in the UB Department of Chemistry. NASA Glen Research Center: "Quantum Dots Investigated for Solar Cells"
Physorg.com: "Quantum Dot Materials Can Reduce Heat, Boost Electrical Output"
The strangely-named, California-based company, XsunX, has released new nearly-transparent building-integrated photovoltaic cells dubbed Power Glass. The glass-like panels incorporate "very thin semi-transparent coatings and films that create large area monolithic solar cell structures that you can see through." The transparency makes the cells useful for coating over glass, plastics and any other see-through structures to create windows that generate power. 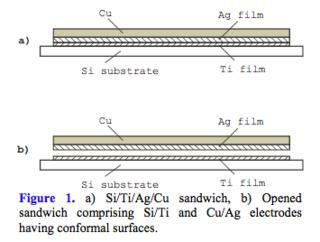 XsunX claims that the cells operate at only half the efficiency of conventional amorphous PVs but due to roll-to-roll manufacturing, reduced materials costs, etc., they claim they can manufacture them for 1/4 the cost. However, they offer no hard numbers here, nor a description of the materials used in the construction so its hard to parse out any factuality in this PR. XsunX writes that "Power Glass™ represents a new breed of solar cell design that balances solar cell efficiencies and manufacturing costs with broad applications and uses." I agree with them that PVs that can be so seemlessly integrated into a building have lots of potential. However, like most of these press releases, XsunX is giving us very little hard info to go off of. An analysis by Salary.com, a provider of compensation-related data, applications, and services, found that the increase in gas prices will effectively wipe out the expected average salary increase (3.7%) for the average worker in the US in 2005. According to Salary.com’s figures, while average salaries will rise 3.7% year over year, the increase in gasoline prices has effectively cut that average salary by 3.3%. Commuting costs have risen 50% in the last year, as gas prices have risen from $1.91 to $2.81 per gallon. At the current gas price level and average full-fleet fuel economy of 17.8 miles/gallon, average American workers, who earn the national average salary of $40,409, spend 3.3% of their paychecks ($1,341 per year) on gas needed to commute to and from work. "And that’s the average worker. Consider workers making the national minimum wage of $5.15 an hour ($10,712 per year) who are currently spending 11.3% of their salary on commuting gas. 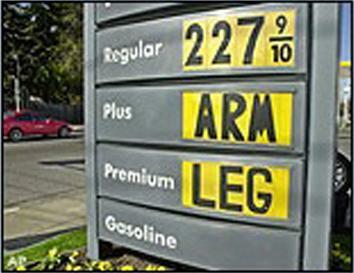 Furthermore, $3.00, $4.00, even $5.00 per gallon gas prices no longer seem out of the question." 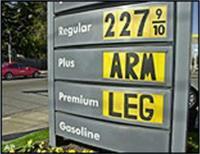 A gas price rise to $5.00 per gallon would cost the average worker $2,384 per year, a whopping 5.9% of their salary. Salary.com calculated the effective gas price salary cut that workers are taking (by city) as a percentage of the average salary of that city. Some of the highest gas prices in the nation, coupled with above average commute times, landed the upstate New York towns of Rochester and Albany into the top 5. The Texas city of Brownsville showed up at #1, mostly due to the fact that wages are not keeping up with rising gas prices. To calculate the effective gas price pay cut per metropolitan area, Salary.com used average commute time data from the US Census and the 2004 Urban Mobility Study by the Texas Transportation Institute. Average fuel economy was assumed to be 17.8 miles per gallon, based on the Texas Transportation Institute study. Fuel prices are based on regular grade gasoline as of September 22, 2005, as reported by the American Automobile Association (AAA) Fuel Gauge Report. It is assumed that commuters purchase gas in the city in which they work. Average salary by metro was calculated by compensation experts at Salary.com and is as of October 1, 2005. All salary dollar values are pretax and based on a 40-hour workweek. Data is based on a total of 500 commutes per year, to and from work, for 250 workdays. Salary.com assumed that employees work 250 days per year and that their travel is equally split between freeway and arterial street travel. The 88 cities used in the study were the sampling of cities analyzed for congestion by the Texas Transportation Institute. Perhaps Americans are finally beginning to wake up to what fuel costs are like for much of the rest of the world. Europeans have dealt with even more expensive fuel prices for decades. Perhaps these higher prices will prompt a real change in behavior in Americans, as it has prompted Europeans to drive less/drive more efficient vehicles. Any opinions on what these higher gas prices portent (other than the end of the world ... keep your apocalyptic scenarios to yourself)? ... and Look At the End of Part 5: That's right! A US automanufacturer is advocating riding your bike! Time studies show that aggressive driving, including fast starts, weaving in and out of traffic, accelerating to and from a stop light doesn’t save much time, wastes fuel and wears out some of the car components such as brakes and tires faster. Don’t leave car idling. Today’s engines don’t need to be warmed up. Prolonged idling creates excess emissions and wastes fuel. Start car and immediately and gently drive away. Turn the engine off when idling more than 30 seconds. Accelerate smoothly and brake gradually. Change lead foot to light foot. Anticipate traffic conditions, and accelerate and decelerate smoothly—it’s also safer and reduces brake wear. Aim to maintain a constant speed—pumping the accelerator pumps more fuel into the engine. Drive at posted speed limits—this is a tip that may save a life as well as fuel. EPA estimates a 10-15% improvement by driving 55 instead of 65 mph. Avoid piling a lot of luggage on the roof rack. The added frontal area reduces aerodynamics and will hurt fuel economy. It can reduce fuel economy by up to 25 percent. Don’t drive at higher speeds with windows wide open. It increases the aerodynamic drag on the highway and lowers fuel economy. Minimize use of air conditioning. Use the vent setting as much as possible. Park in the shade to keep car cool and reduce the need for air conditioning. Remove excess weight. Unnecessary weight makes the engine work harder and consume more fuel. Maintain a proper engine tune-up to keep vehicles running efficiently. Keep the wheels aligned. Wheels that are fighting each other waste fuel. Under-inflated tires increase rolling resistance and reduce fuel economy. They also wear rapidly. Check the vehicles door-post sticker for minimum cold tire inflation pressure. Keep tires properly inflated to the recommended pressure—this alone can reduce the average amount of fuel use by 3-4 percent. Replace the air filter as recommended—always consult the owner’s manual. Use good quality, energy-conserving (EC) oils with a viscosity grade consistent with the manual. Buy cans marked with the symbol ECII, which is the American Society of Testing Materials logo for fuel-efficient oils. Use a fuel with good detergent additives—to keep the vehicle engine clean and performing efficiently. Plan and consolidate trips to bypass congested routes and avoid stop-and-go traffic. When feasible, carpool. Consider parking instead of using “drive-up” lanes. Use a high-quality fuel with the lowest appropriate octane rating. Check the owner’s manual for the manufacturer’s recommendation. There is no benefit to using premium gas in a vehicle calibrated for regular. Consider walking or bicycling for short distances. Take note of part five. Who would have ever thought we'd hear a US automaker advocating that you ride your bike instead of drive their car? What's that happing up in the sky? Oh! That's the moon crashing into the sun! Well, I guess Ford doesn't care if your Explorer sits in the drive way as long as you bought it. The Washington Post has an article on the changing automotive market. "We are seeing people who are driving $40,000 Suburbans trading them in on $15,000 Corollas," said Mathews, who manages a dealership in a state where big trucks and sport-utility vehicles rule the roads. "The last 30 days have been unlike anything I've ever seen in the automotive industry." Civics, Focuses and Corollas are flying off the lots - in certain cases they are being bought straight off the shipping trucks - and unsold full size SUVs are piling up (despite all the incentives and discounts). All that in a market where consumers don't even have all that many small cars to choose from, so it's not far-fetched to predict that the small japanese cars that are coming to North-America soon will be quite successful and that more will come from all automakers. Hybrids are very hot too (August was a record-breaking month), but sales are limited by the supply side for now. We've also read on many cyclist blogs that there are more bikes on the roads. All of this is far from being enough, of course, but it's nice to finally see some mainstream movement in the right direction after over a decade of things getting worse. Well this is an encouraging trend, but I would like to caution that it is likely a knee-jerk reaction to the spike in gas prices caused by Katrina and Rita. Time, and likely where gas prices eventually settle out (this winter will be an interesting one! ), will tell if this trend will continue. I imagine that, at least, sales of SUVs will level out, rather than continue to rise as they have been recently. GM Vice Chairman Bob Lutz seems to agree with me here. Check out this related article over at Green Car Congress. Furthermore, I bet we will continue to see hybrids selling as quikly as they can be manufactured, at least for the next couple of years. Now let's just hope that the government gets in on the act here and helps push along this new consumer trend. See my previous post on a proposed bipartisan bill to increase CAFE standards by 32% in the next ten years.